At some point John Earlie moved to Bogalusa, Louisiana, a town about forty-five minutes south of Lexie, Mississippi where he grew up. He worked as a laborer in Bogalusa for eight years before his tragic and sudden death at 4:30 p.m. on 10 April 1937. John Earlie was single at the time that he died and only 34 years old. The coroner listed “angina pectoris,” a symptom of coronary artery disease, as the cause of death. His mother, Ardella, retrieved his body and he was buried at Bogalusa. It was the first of two deaths for the Magee family in 1937. John Earlie’s older brother Percy would die in September of the same year, also in Bogalusa. Church of Jesus Christ of Latter-day Saints, Record of Members Collection. 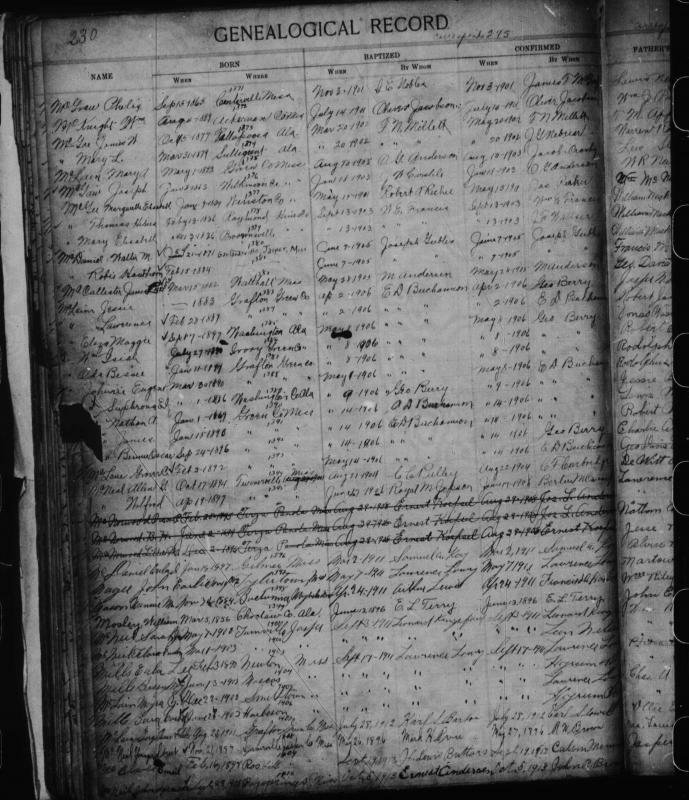 CR 375 8, box 4256, folder 1, images 246, 350, 451. Church History Library, Salt Lake City, Utah. “Mississippi,” Liahona: The Elders’ Journal (Independence, MO) Vol. 8, No. 49 (May 23, 1911), 778. United States Census, 1910, 1920. Pike County and Walthall County, Mississippi. Church of Jesus Christ of Latter-day Saints, Record of Members Collection, CR 375 8, box 4256, folder 1, image 246, 350, 451, Church History Library, Salt Lake City, Utah; United States Census, 1910, 1920, Pike County, Mississippi; John Lawrence Lowry, Early Mormon Missionaries database, Church of Jesus Christ of Latter-day Saints. Freda Lucretia Magee Beaulieu, address, 1982 January 16, 2,5, MS 6938, Church History Library, Church of Jesus Christ of Latter-day Saints, Salt Lake City, Utah. John Earl Magee, 10 April 1937, Louisiana Deaths, 1894-1960, Bogalusa, Washington Parish, Louisiana, certificate number 6102, microfilm 2,205,575, Family History Library, Church of Jesus Christ of Latter-day Saints, Salt Lake City, Utah.